The Benington Books series contains new fiction, essays, and translations, but no verse, and “The publishers aim to exclude anything that is no, for some pertinent reason, notable.” The series was named for its editor, Wilson Benington, an author and co-director of the Scholartis Press and Eric Partridge Ltd. Six titles were published in all. 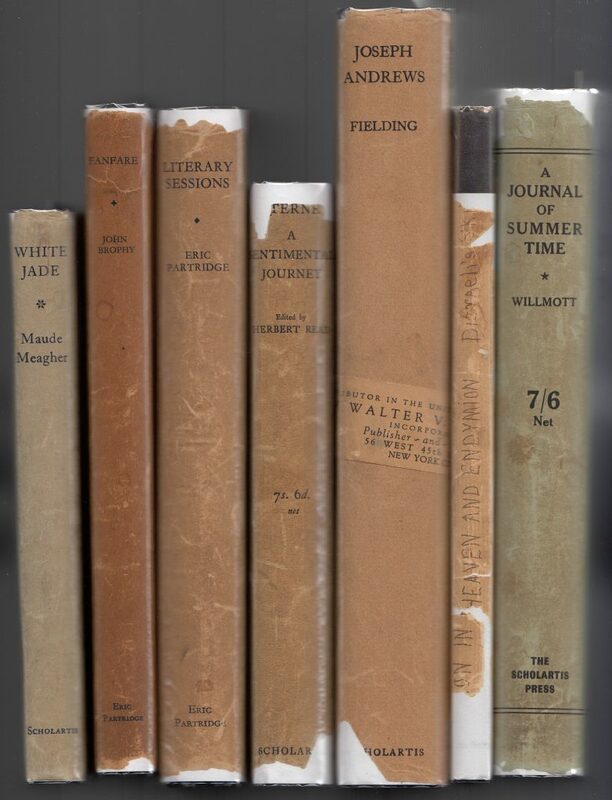 As with the other Scholartis series, those for the Benington Books were plain and common to the series, printed on heavy paper. The jacket spine and front include the title, author, and publisher. The front flap contains a blurb about the author, in this case, John Brophy. 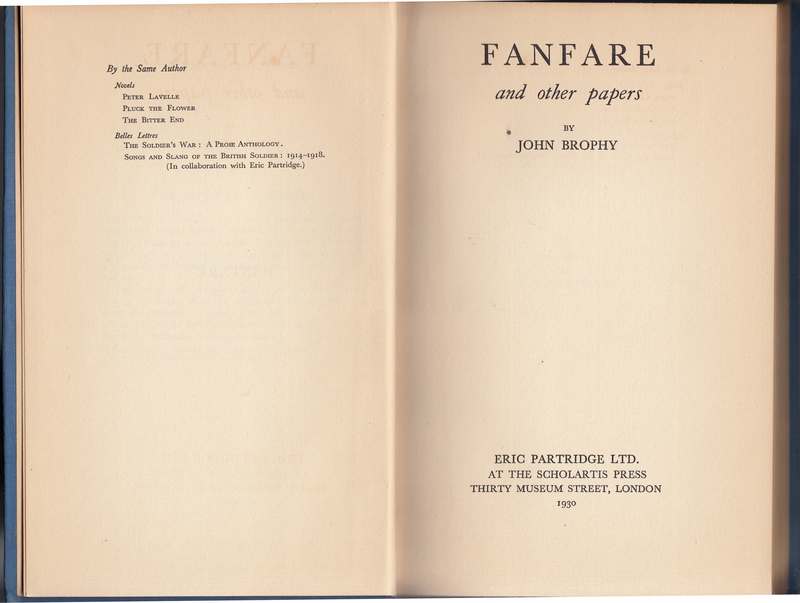 His Fanfare and Other Papers was #1 in the series, published in 1930. 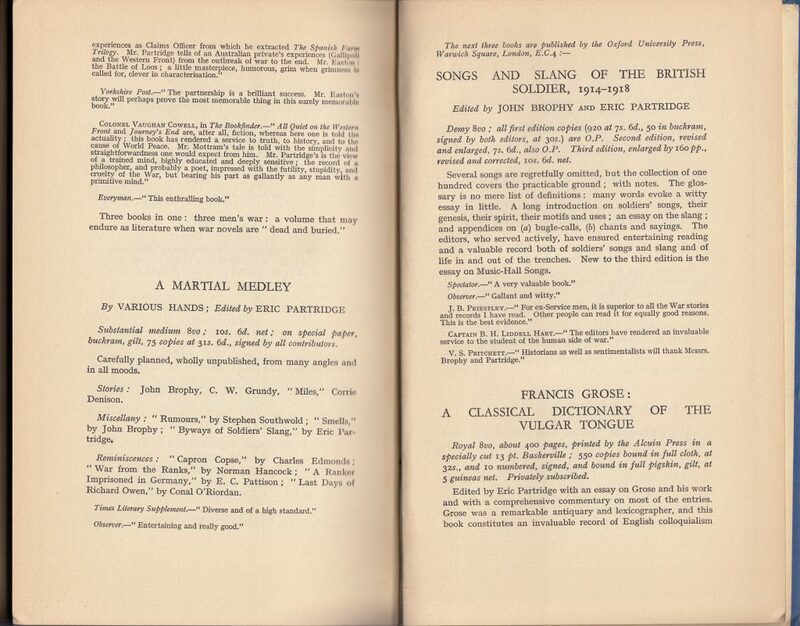 Brophy, a soldier in WW1, had, also in 1930, co-authored Songs and Slang of the British Soldier, 1914–1918 with Partridge. The price of the book is also included on the front jacket flap, 7s./6d. in this case. 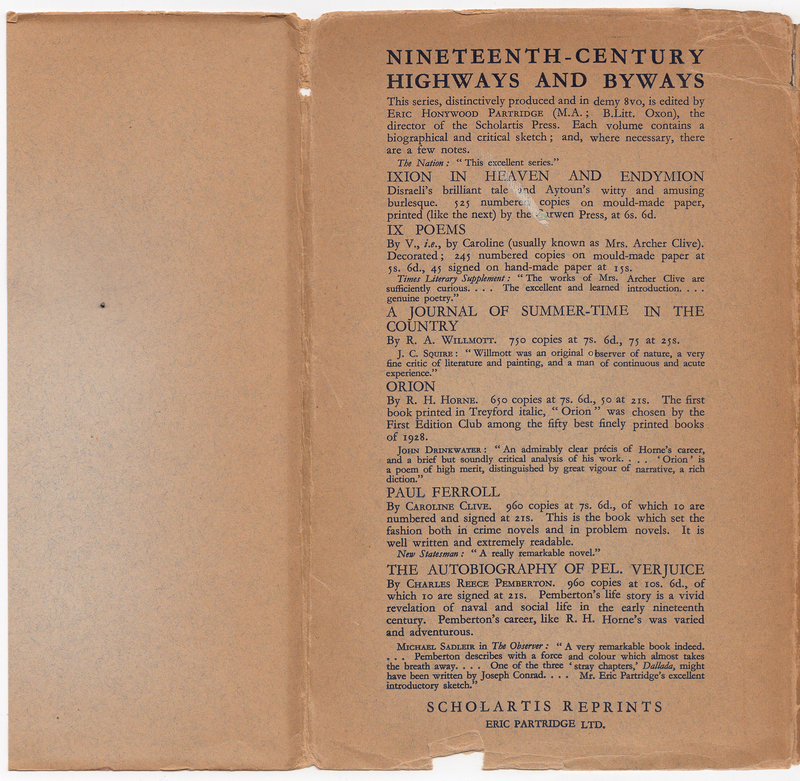 The rear of the jacket advertises Scholartis’ Nineteenth-Century Highways and Byways series. 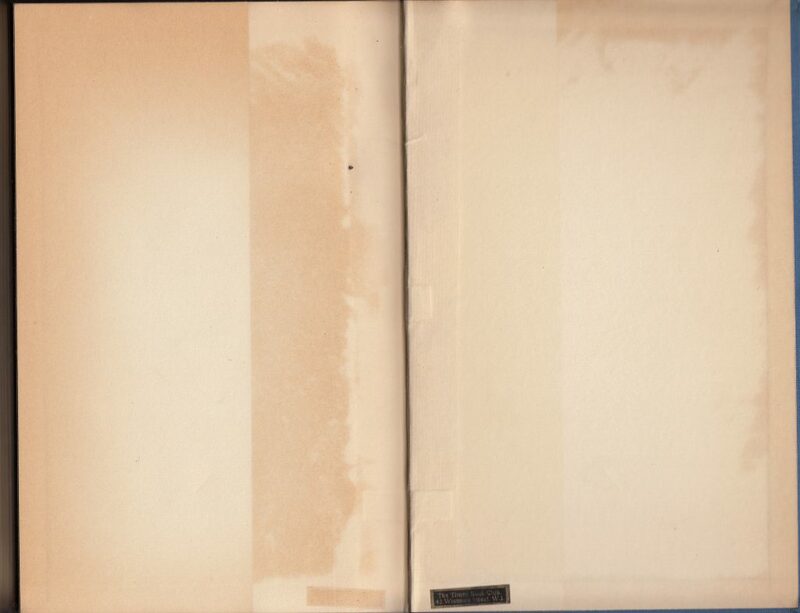 The rear flap is blank. 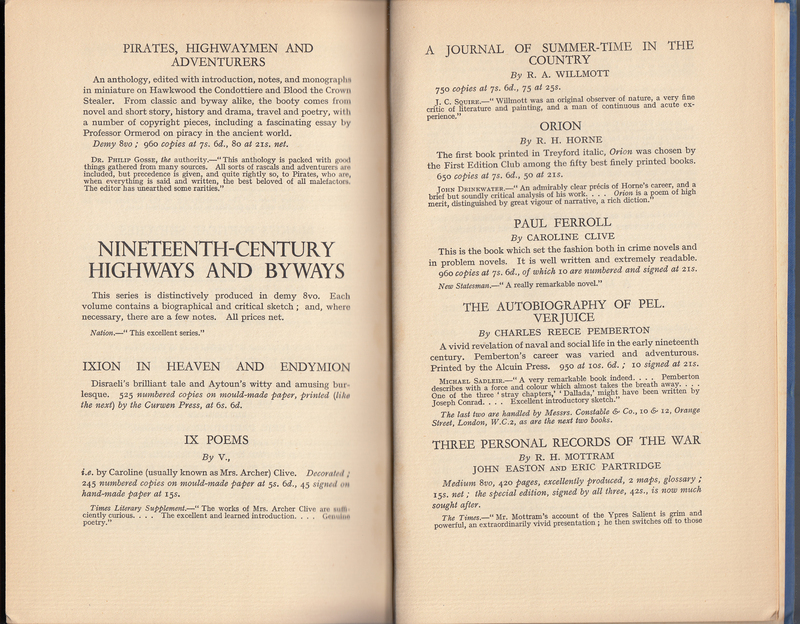 1930: #1. 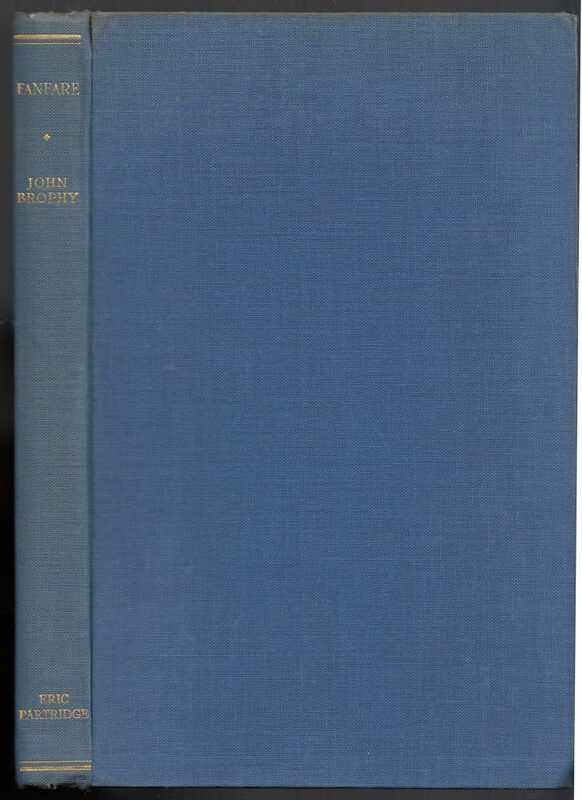 John Brophy. Fanfare and Other Papers. 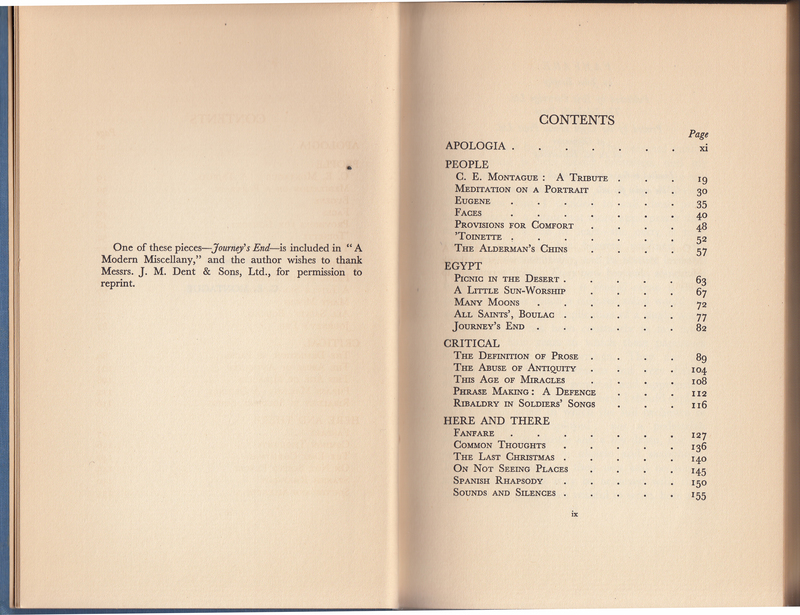 1931: #2. George Baker. Cats’ Meat and Kings. 1931: #3. Frank Binder. A Journey in England. 1931: #4. Charles Maurice Chenu. My Canoe. Translated by Bertram Ratcliffe. 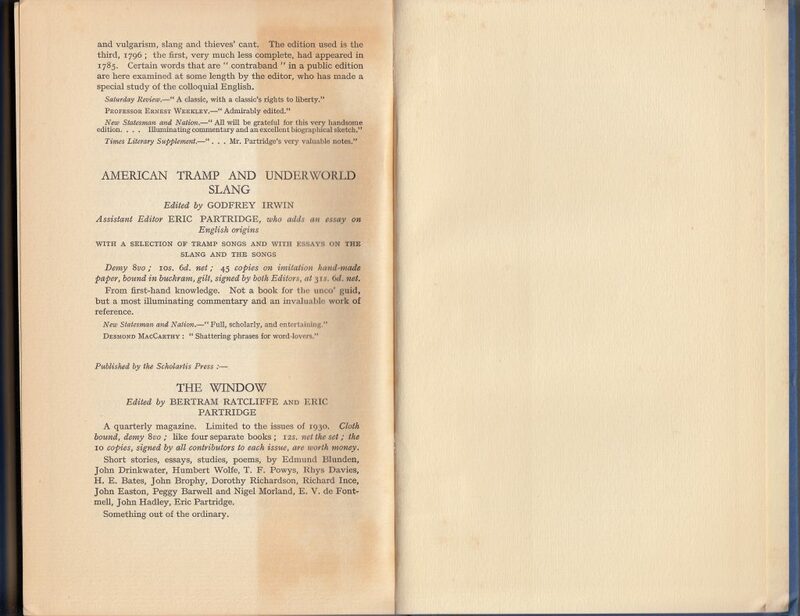 1932: #6. Eric Partridge. 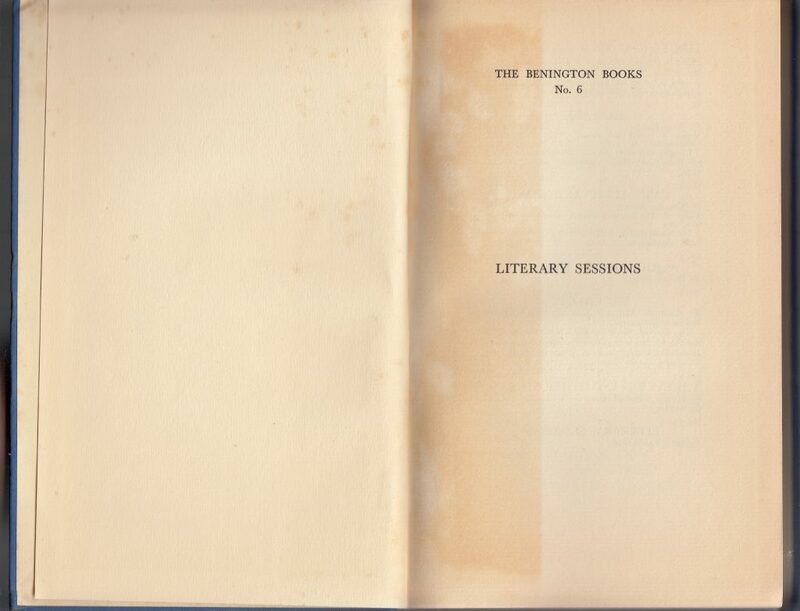 Literary Sessions. 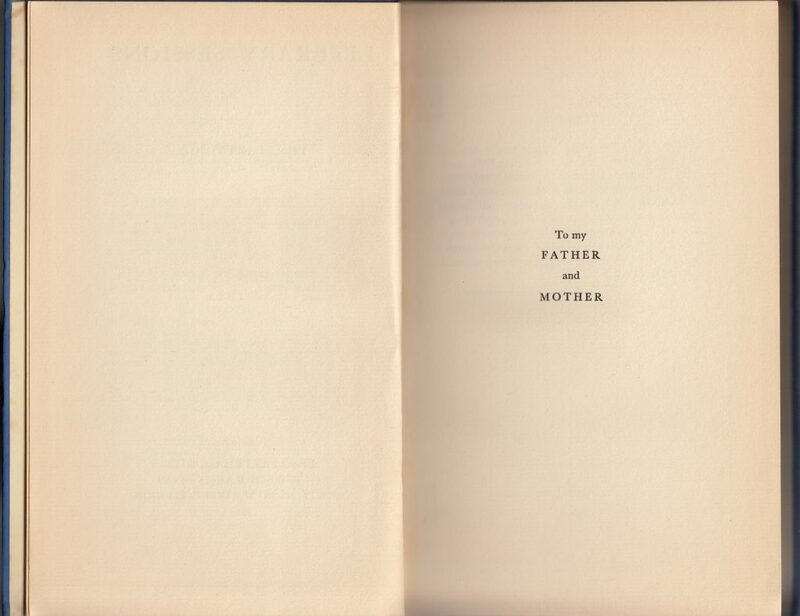 Bound in blue cloth, there is minimal typography on the spine. 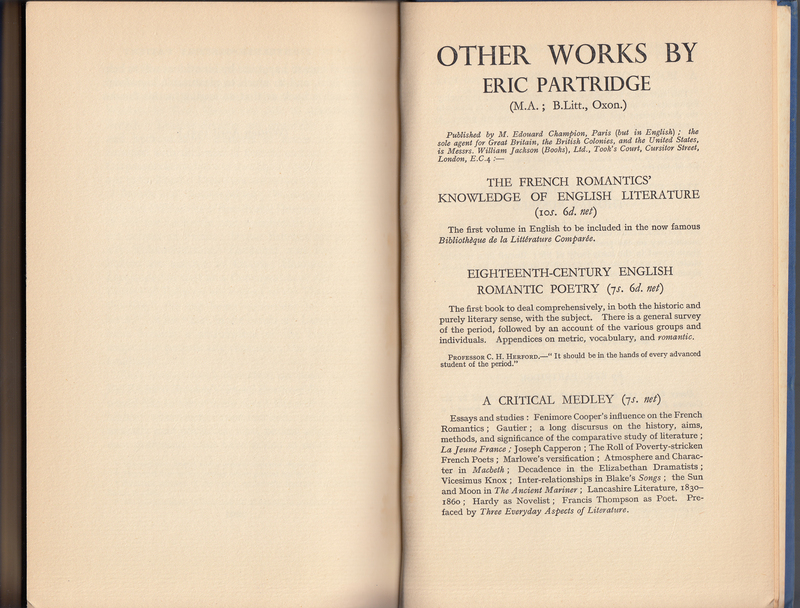 In this case, Erik Partridge is indicated as the publisher. 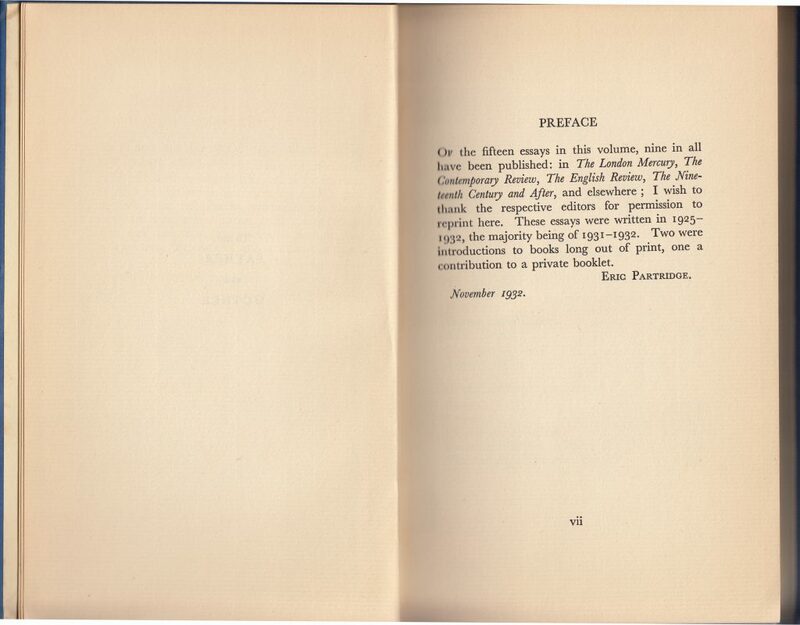 Scholartis Press and Erik Partridge Ltd. were, in essence, the same publisher. Later Scholartis titles used the Partridge imprint more often. 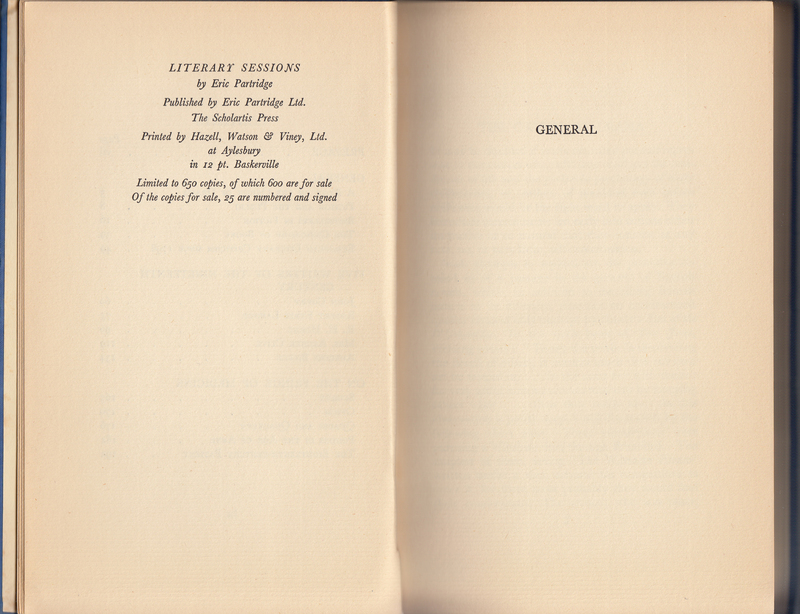 Facing the half-title page is a series prospectus (reproduced above). Unlike other Scholartis series, there is no list of titles in the series. A list of titles by the author faces the title page, with its 1930 date. The dedication to C.E. 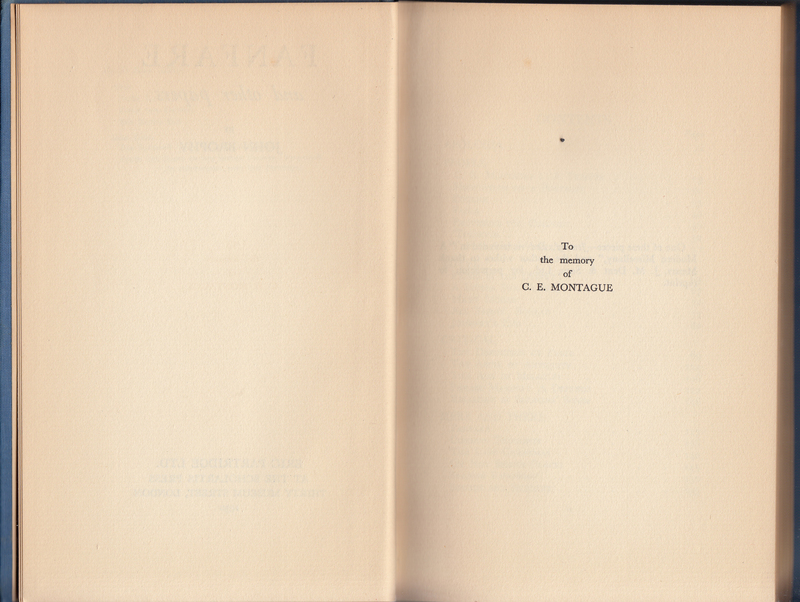 Montague. 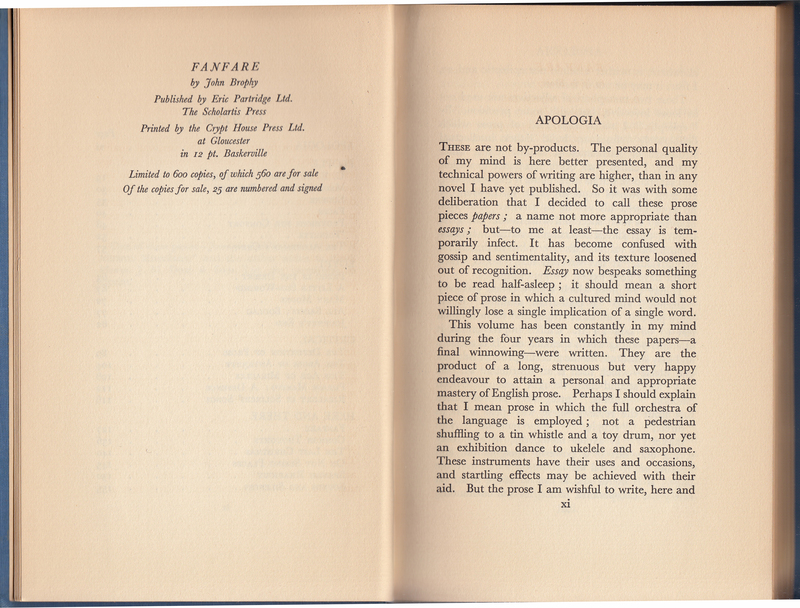 A note on the previous publication of one of the essays faces the contents. 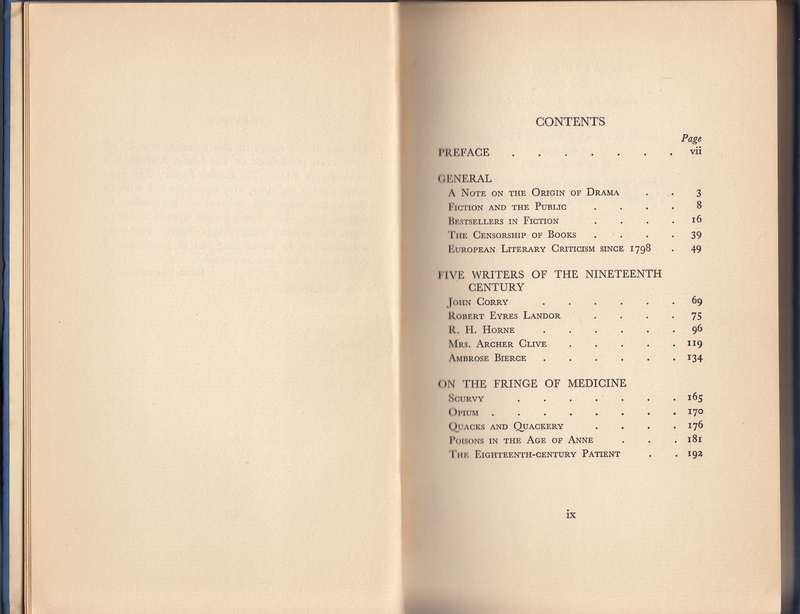 As is common with Scholartis Press books, a summary of pertinent book details is included: besides the title, author and publisher, the printer (Crypt House Press Ltd., Gloucester), type (12 pt. Baskerville) and limited edition details (600 copies total including 580 for sale, with 25 of those signed and numbered). 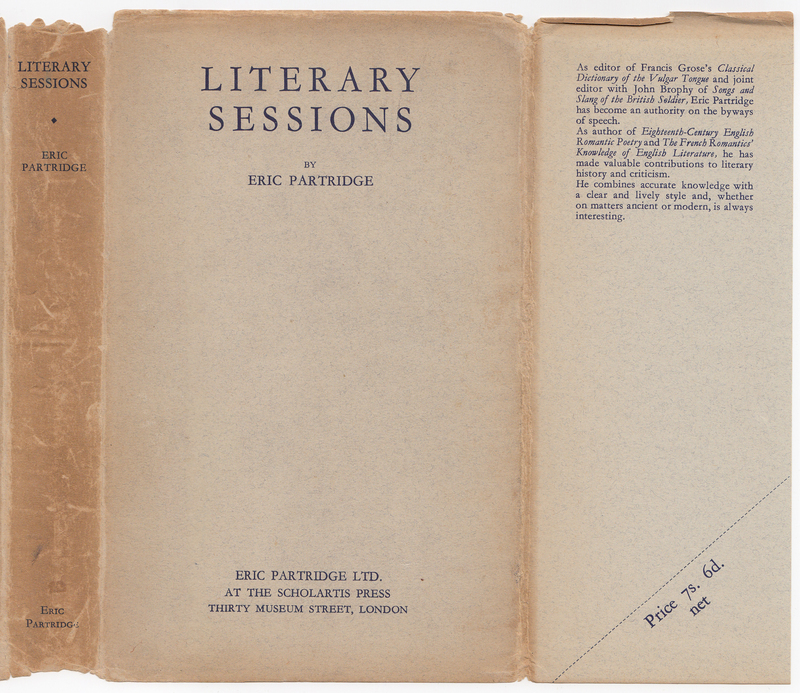 The rear endpapers include a bookseller tag, in this case, The Times Book Club, 42 Wigmore St., W1 (London). 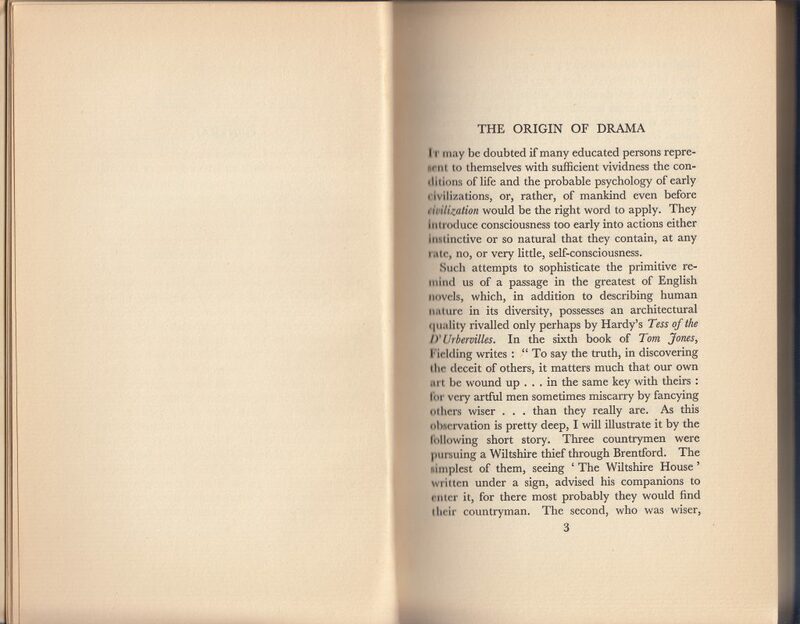 This was a prestigious bookstore run by the London Times, which had its own book club and lending library. 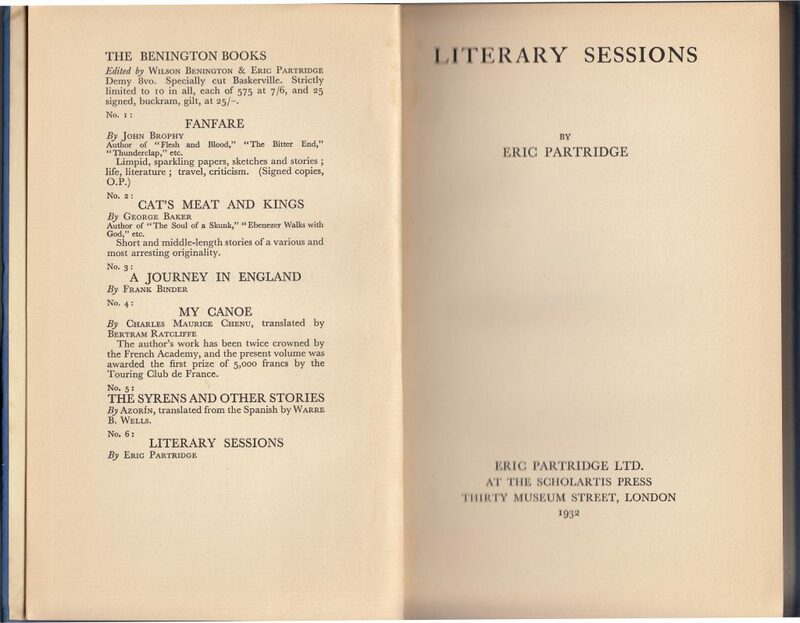 Eric Partridge had the (maybe, probably not) privilege of having the final book (#6) in the Benington Books series, a collection of essays (many previously published) entitled Literary Sessions, published in 1932. By and large, the book and jacket are the same as the Brophy title (#1 in the series) above. 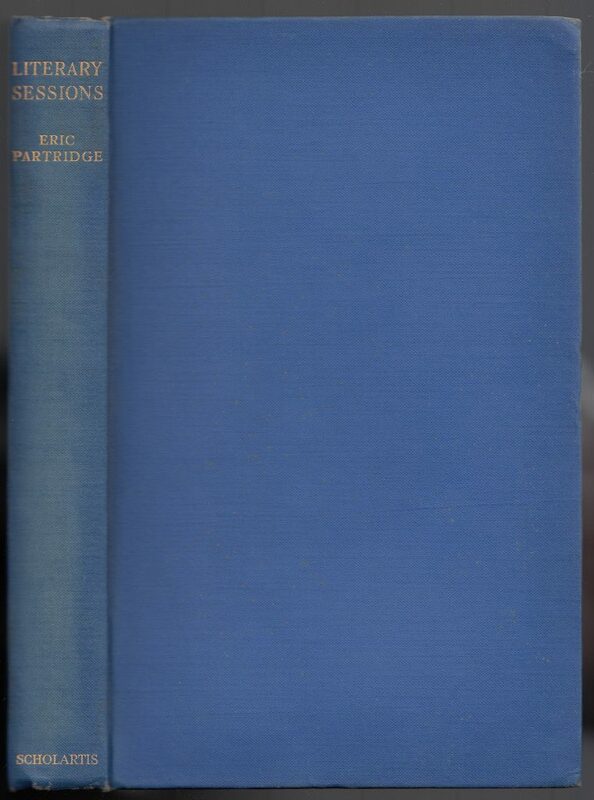 The plain jacket includes the title, author and Eric Partridge imprint on the spine, title author and imprint on the jacket front, a blurb and price 7s/6d) on the front jacket flap. 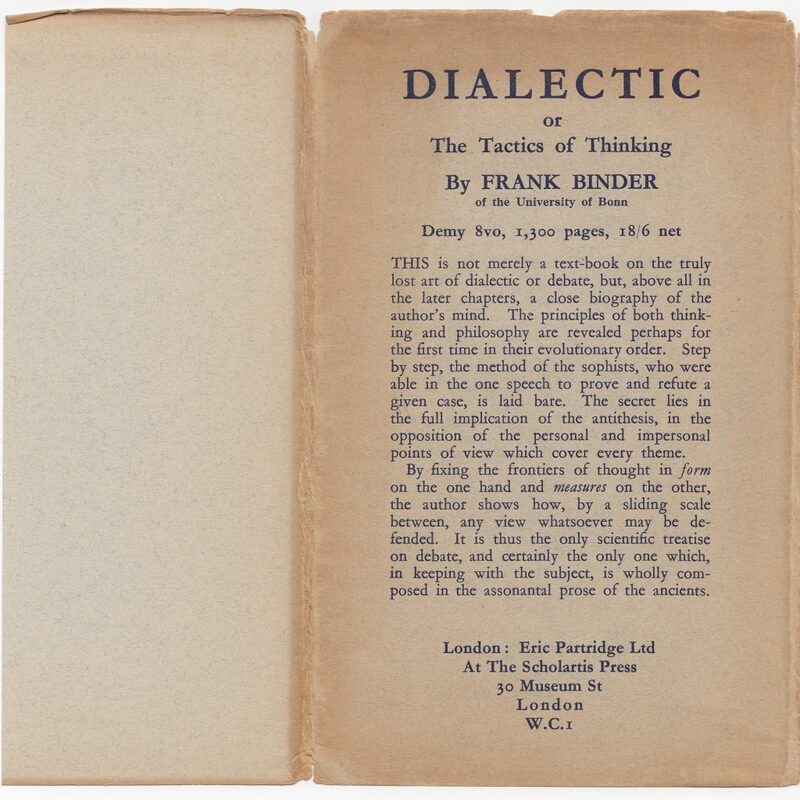 The rear of the jacket is taken up by an advertisement for Frank Binder’s Dialectic, or The Tactics of Thinking. 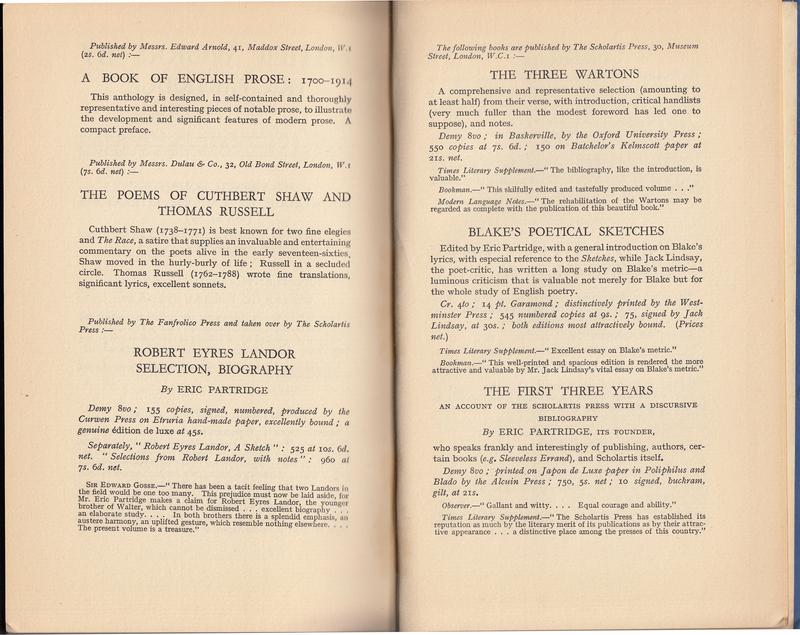 The page facing the title page includes all six titles in the Benington Books series, as edited by Wilson Benington and Eric Partridge. The year of publication (1932) is under the publisher’s imprint. As with other Scholartis Press books, details about the book are included on the page prior to the start of the text. 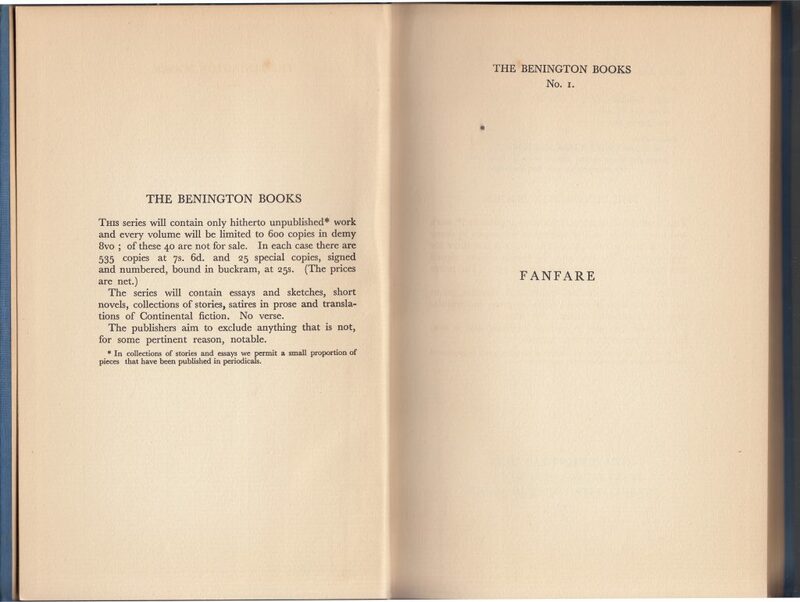 The book, printed by Hazell, Watson, and Viny, Ltd. at Aylesbury uses 12 point Baskerville. 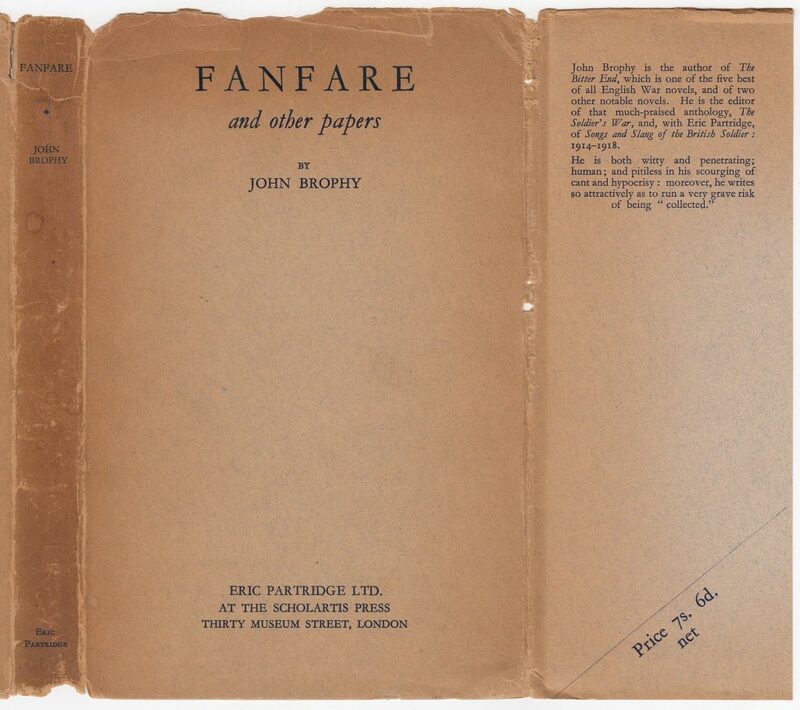 650 copies were printed, 25 numbered and signed (not including this copy). The rear of the book contains a catalog of other books by Eric Partridge as well as Scholartis Press titles (including prices, summaries, reviews, etc. ).